This production is restricted to over 16s only. Contains strong language and adult themes. From the writer and creators of ‘Doreen’ comes another award-winning comedy – and a very different theatrical experience. 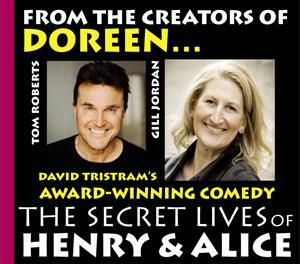 David Tristram’s hilarious insight into married life stars Gill Jordan (known to thousands on social media as the Black Country legend Doreen) and Tom Roberts (Emmerdale, Doctors, 2.4 Children, Coronation Street, Hustle). Henry and Alice, a married couple with apparently only a pet goldfish in common, fantasize their way into outlandish situations to escape the tedium of their everyday lives...but will anyone see the extraordinary twist coming?